From the second half of the 1990s, many business groups emerged, and poured investments into portals and the e-commerce. Gradually, this network that generated opportunities of all kinds, began to give way to a Darwinist movement. With the injection of a lot of money, the strongest ones began driving out or acquiring the weaker. In 2000, there was the fateful bubble burst of dot.com enterprises – whose summit was the fall of 78% of NASDAQ index in October of that year. And the survivors of this storm got even stronger to dominate the Internet ocean – in the same manner other sectors of the economy are dominated. From then on, the Internet began to change even further. Digital convergence was making progress and the trajectory of communications and capital flow concentration remained the same. Personal data of millions of people, previously scattered in the hands of many, was getting increasingly concentrated, creating a quiet market in an almost unregulated environment. The virtuous and creative public space of the web began showing its dark side. The network was gradually colonized by Google, Yahoo, MSN, AMAZON, and a handful of giants. The time of garage servers and numerous small webhosts was definitely left behind. Even the friendly Geocities, one of the entrance doors to the web, bought in 1999 by Yahoo, was dehydrated until its sacrifice in 2009. At that time the existence of the “NSA key” in operating systems from Microsoft was already revealed, in addition to web traffic monitoring through software such as Carnivore, of the FBI – later replaced by Narusinsight. The Internet was not for “amateurs”. And in 2006, an employee of AT&T accused NSA of mass monitoring through the company’s cables to Electronic Frontier Foundation. Born as a technology of military use, the Internet was now the subject of growing interest to intelligence services. At that time, the US State Department started harassing the “.com” giants to turn them into its surveillance operational arms. It is striking that in September 2007, Google’s millionaire owners, Larry Page and Sergey Brin, were granted the exclusive privilege of using Moffett Federal Airfield (MFA) base, in San Francisco, for its Boeing 767 – “Google Party Plane” – and two other Gulf Stream jets from the Armed Forces of the United States. No charges had been pressed against the company up until then, but the volume of information in its possession raised suspicions that intelligence agencies were leaking information about it. At that time, Facebook was booming, alongside other large services, which would integrate Prism next to Microsoft, AOL, Skype and Apple. At this point, mainly because of government and corporate surveillance, privacy on the Internet was completely compromised. This would only become public a few years later with Edward Snowden’s leaks in 2013. NSA’s documents showed that Prism had started exactly in 2007. Today, we know that only by using encryption we can have a reasonable degree of privacy protection in communications. And yet, our contact networks, communications records and part of other metadata end up leaking due to network protocols. The protection of digital rights is now a global struggle. In Latin America, it becomes increasingly clear that the fight for digital rights is part of a larger agenda for democracy, which goes beyond privacy, freedom of expression, right to communication or culture; it includes the defense of a participatory democracy to reduce social injustice and promote social inclusion. Thus, we have a major challenge – promote local guidelines and also follow global issues such as surveillance, secret trade treaties and Internet governance. Themes that are permeated by complex technical and political issues. Another major challenge is to raise awareness, through a clear and accessible language, relevant political players – such as NGOs, trade unions, social movements and the academic environment. And how can we explain to ordinary people that the right to privacy is essential to ensure other rights? In this scenario, which alternatives are out there? Should we ask everyone to use GNU/Linux operational system and learn to use encryption tools? It is more realistic to believe in the need for a deeper change, at an ethical level, and that pervades people and institutions. And this change must be global as the Internet – whose structure is the basis of economic and social relations on the planet. ICANN and the Brazilian government sponsored Net Mundial (Global Multistakeholder Meeting on the Future of Internet Governance) in 2014. Despite online public consultation, the final result was agreed in diplomatic meetings behind closed doors, resulting in a bland and not very useful document. But the event served to show that the board pieces can be moved by other players and respect for human rights has become a starting point for international and intersectoral debate. Going back to the beginning of this text. We must recapture the spirit of the Internet as a scattered and little controllable communication network. A free and open public space. And that works primarily not for governments, corporations or hidden interests, but to serve people and human development. The Internet should serve as an example to show that sectors of social life can be governed autonomously, in shared, fluid and diverse spaces, without interference, other than to promote or safeguard rights. Partially global, the fight for digital rights is long and full of challenges, but as Portuguese poet Fernando Pessoa (1888-1935) once said: “the path is paved by walking”. Fruto de uma parceria entre a CGM e o Colaboratório de Desenvolvimento e Participação (Colab), foi aberta na quarta-feira (30/9), através da na plataforma São Paulo Aberta, uma consulta pública para discutir a política de licenciamento para todos os tipos de conteúdos produzidos por seus órgãos e entidades, bem como por eventuais parceiros conveniados com o Município. O documento será discutido na próxima terça-feira, 6/10, em um encontro a ser realizado no Arquivo Histórico Municipal (detalhes abaixo). 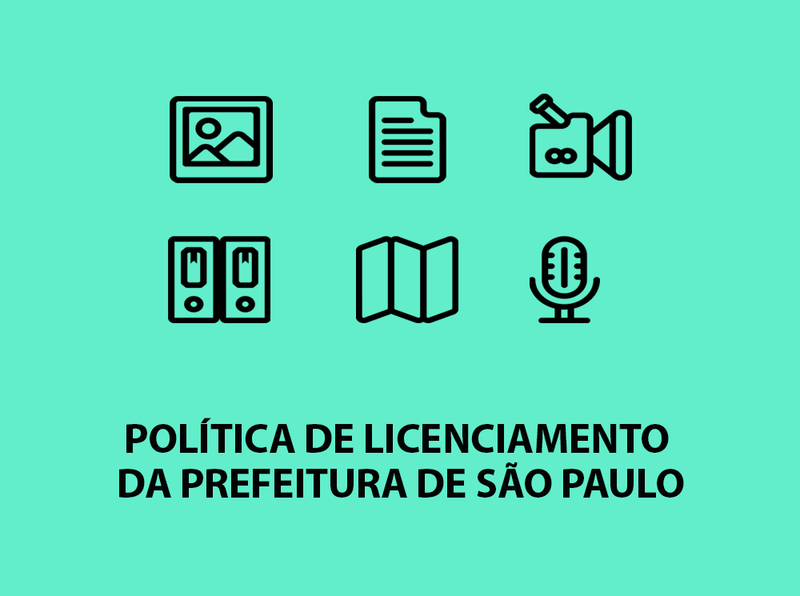 A discussão deve resultar em um documento público que servirá como base para as recomendações de licenças específicas a serem utilizadas pelos órgãos e entidades da administração pública municipal. Inscrições: gratuitas, por meio deste formulário.